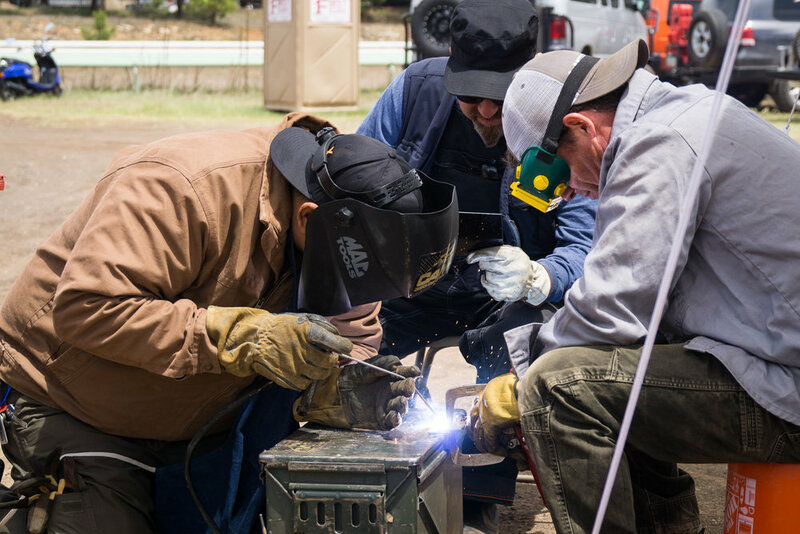 Details about Overland Expo EAST near Asheville, NC, November 9-11 2018, will be available in June 2018. What's better than learning driving skills and hands-on instruction from Camel Trophy competition experts? How about more of it? This year we are bringing you a bigger and more dynamic Camel Trophy Expedition Skills Area. That also means more of the classes you want: Driving Skills, Maintenance and Repair, Recovery, and Static Skills. Learn overland skills such as winching, rope-work and lashing, recovery, specialty substrates, and spotting. Want to know how to get unstuck with only what you have on hand? The fundamentals of winching? Arm yourself with the best tool in the tool box . . . knowledge. 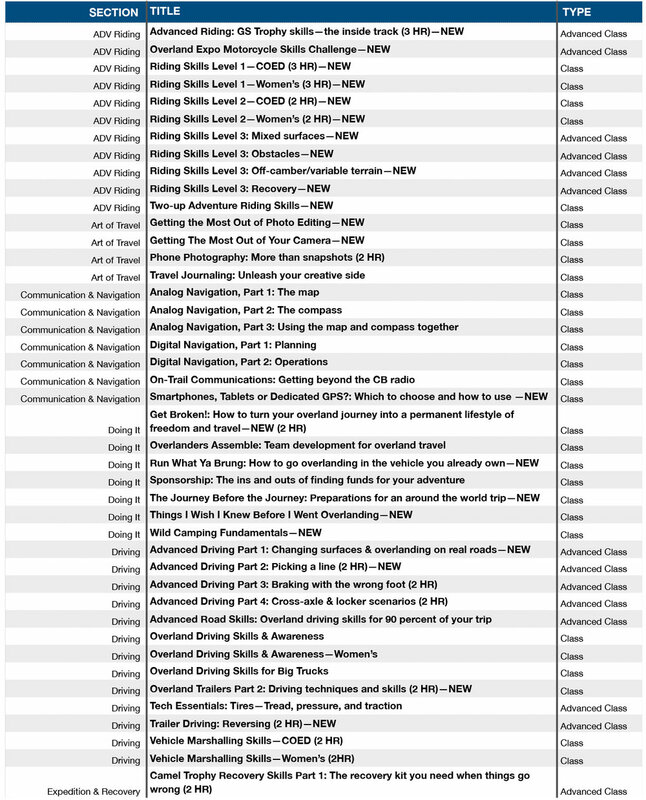 To sign-up and participate in classes taught by the Camel Trophy or 7P International Training Teams, register for Overland Experience. New for 2018, a re-designed Motorcycle Expedition Skills Area, headed by Dragoo Adventure Rider Training (DART). On a custom built training course, learn the ADV riding skills that will take you confidently off-the-beaten-path. Whether you are new to off-pavement motorcycling, or wanting to advance your skill set, we have classes for every level. After a weekend of training, don't miss the Obstacle Course Challenge on Sunday! To sign-up and participate in adventure riding classes or compete in the competition, register for Overland Experience. 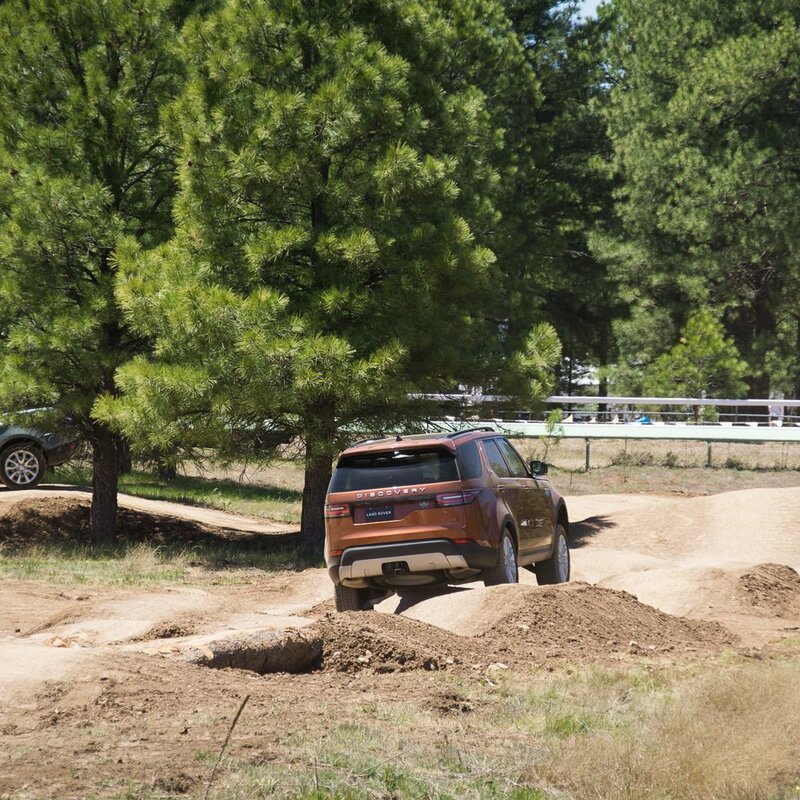 Returning for another year, Land Rover Experience is sponsoring the on-site overland driving course. Develop off-road skills to tackle any terrain, whether you explore locally or globally. The course will be staffed by a dozen of the top overland driving skills trainers in the world to provide one-to-one coaching from an expert instructor. NOTE: Land Rovers are not loaners; they are for brief, accompanied drives on the Overland Driving Course. There are no on-site rentals. To drive your own vehicle on the course (or use a Land Rover provided vehicle), register for Overland Experience. To drive a Land Rover provided vehicle on the course, buy a Weekend Pass with Camping or Day Pass. Bringing their tech skills to yet another show, BFGoodrichTires will be hosting a teaching area focused on tire technology. Understanding how to choose the right tires for the terrain you're on will set you up for better success during off-pavement driving. Sign-up to test drive a vehicle outfitted with different tread patterns, discover the difference on various terrain, and get advice for tires for your own vehicle. Everyone (Overland Experience, Weekend Pass with Camping or Day Pass) can participate in the test drives and seminars. Everyone (Overland Experience, Weekend Pass with Camping or Day Pass) can participate in seminars and demos. Everyone (Overland Experience registrants and Weekend Pass with Camping / Day Pass) can attend product demos. New this year for, kids ages 8 and up can participate (with supervision) in the Kids Expedition Skills Area— located at the Camel Trophy Adventure Skills Area. Kids will learn real skills for the real world the Camel Trophy training team. Everyone (Overland Experience registrants and Weekend Pass with Camping / Day Pass) can attend kids activities. 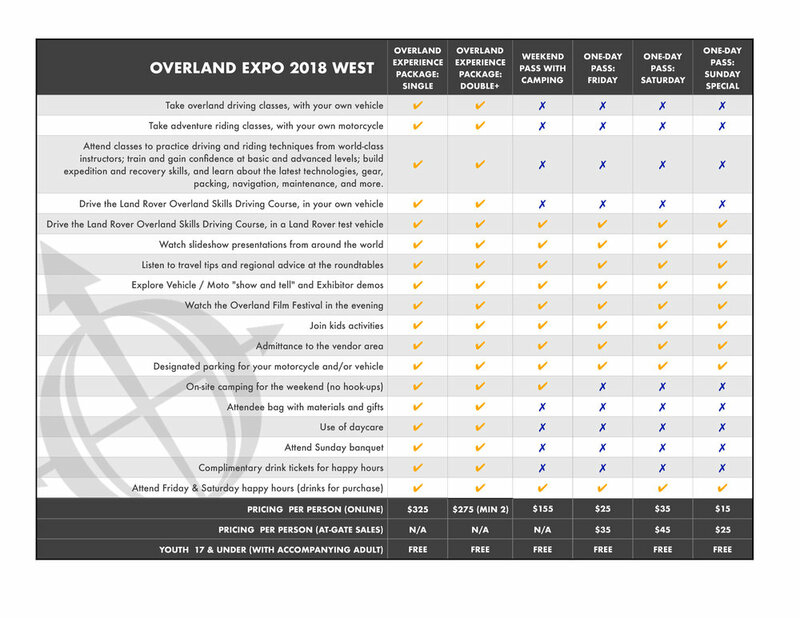 Everyone (Overland Experience registrants and Weekend Pass with Camping / Day Pass) can attend roundtables. Everyone (Overland Experience registrants and Weekend Pass with Camping / Day Pass) can attend slideshows and films. Class selection began early March 2018. Invites are sent out via email by registration order - those who register first, get first pick! 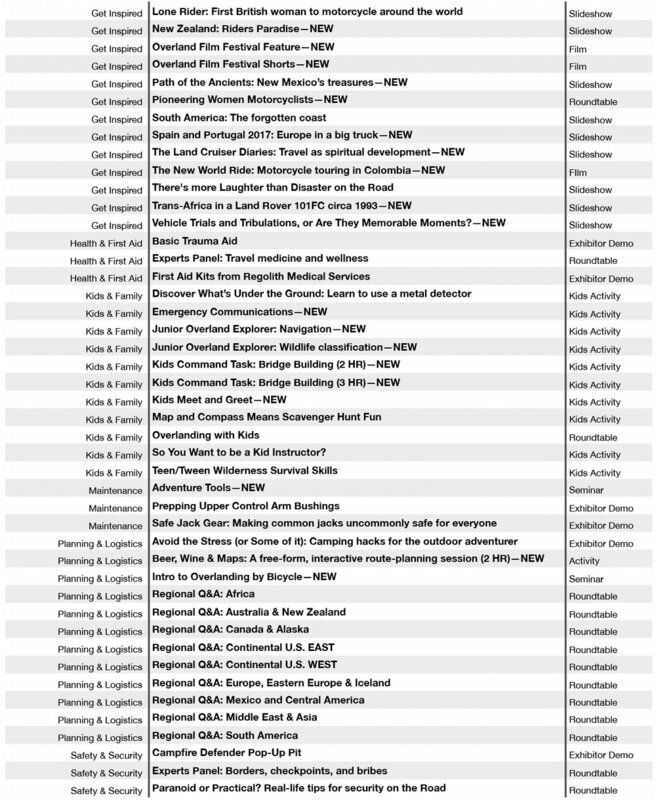 The following 30 classes are full and waitlisted, but we still have 300+ other classes and programs available. Most other riding classes, Friday sessions are full, but Saturday sessions are still open for sign-ups. For 2018 WEST, we have 320+ different classes and programs, totaling 460+ session hours. The following is for reference only. See schedule for times and locations.